Much of this article on the life of John Qualtrough Ewens has been compiled from the Preface of the book "Essays in Legislative Drafting", edited by David St L Kelly, published in 1988 by Adelaide Law Review Association, Law School, University of Adelaide, Adelaide, South Australia in honour of John Q.Ewens 80th birthday, but very much condensed. of course. I wish to thank Ian Leader-Elliott, Editor of the ADELAIDE LAW REVIEW for allowing me to use this material. Contributions have also been made by John Q Ewens son Warren, who I also wish to thank. It seems appropriate to be writing this profile on the distinguished life and career of JOHN QUALTROUGH EWENS in this, the Centenary Year of Federation of Australia, 2001. John Qualtrough Ewens was born in Salisbury Street, Unley, Adelaide, South Australia, on 18 November 1907. He was the son of Leonard John Ewens and Amy Effie QUALTROUGH. John had one brother, Leonard, and a sister, Kathleen. Leonard died in 1985 and Kathleen is still alive in 2001 and lives in Adelaide. Amy Effie QUALTROUGH was born 18 October 1882 in Adelaide, the daughter of Thomas Joseph QUALTROUGH, himself baptised 23 April 1854, Rushen Parish, Isle of Man, youngest son of Thomas Qualtrough and Elizabeth Moore, ( See Chart 11 – right drop tree, of A QUOTA OF QUALTROUGHS ) and his wife Ellen Catherine Wisdom. Amy was the only child of Thomas and Ellen Qualtrough. Thomas died in an accident in 1883 in Adelaide when Amy was 9 months old. John Qualtrough Ewens attended St Peter’s College in Adelaide from 1920 – 1925 where he immediately showed a proficiency in languages. He went on to study law at the University of Adelaide where he graduated with a LLB in 1929, winning the Roby Fletcher for Logic and Psychology and a Stow prize in Law. During his first year of study, John had become articled to Charles Hargrave, a partner in the firm Knox and Hargrave, Solicitors of Adelaide. John completed his studies and was admitted as a barrister and solicitor of the Supreme Court of South Australia in December 1929. He continued to work for Knox and Hargrave, and was involved in a wide variety of work, principally in the field of commercial law. Although a brilliant career in private practice in Adelaide could have been his choice, he instead was advised to apply for a vacancy in the Commonwealth Attorney General’s Department in Canberra (Australia’s Capital) left vacant by the retirement of Sir Robert Garran. It proved a wise choice as it offered him many more opportunities to further his strong interest in constitutional law. He was accepted for the position in 1933 and he said at the time: "I succeeded Garran. He went out at the top; I came in at the bottom." John married Gwendoline Wilson in 1935 and they had two sons, Warren and Peter. Their life together as a family was to be in Canberra for the next 60 years. John’s special abilities did not take long to become noticed. In a reshuffle of the Attorney’s Department just prior to the War, he "jumped the queue" over several of his colleagues. He had special drafting abilities and these became in great demand during the war, particularly in the area of National Security legislation. In 1944, a position of Assistant Parliamentary Draftsman was created for him. Then in 1948, John Qualtrough Ewens was appointed Parliamentary Draftsman following the retirement of Martin C Boniwell. He continued in this position till 1970. The Department was reorganized during this year and the Office of Parliamentary Counsel was created as a separate statutory organization. 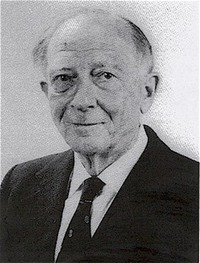 John Ewens was the first appointed Head of that office – the first "First Parliamentary Counsel", a position from which he retired in 1972, at the age of 65. John Q Ewens’ contribution to the statute book of the Commonwealth of Australia cannot be over emphasized. He drafted a vast amount of important and, at times, controversial legislation. His ability to express his legislation drafts concisely and precisely was renowned. He searched for economy and precise and simple English which was not always easy when there were professionals looking for loopholes. This ensured his ability was always tested to the utmost. A major task was the drafting of legislation to nationalise the banks of Australia in 1947. He always maintained, even after this legislation was rejected by the High Court and the Privy Council as unconstitutional, that it did not conflict with the Commonwealth Constitution. The idea of nationalising the banks was first mentioned by the then Prime Minister, Ben Chifley, in Ewen’s office with only Chifley, Solicitor-General, Kenneth Bailey, and John Ewens present and he told no-one about it at the time. Much later he reminisced that as he looked out the window of his office, Chifley made his plans clear. Ewens thought this was going to be a most divisive and controversial thing to do. Even though he had said at the time that the legislation did not conflict with the Constitution, he had thought it was not a wise thing to nationalise the banks from Chifley’s point of view as far as the 1949 elections were concerned. He also admitted that he, being quite a conservative person, did not like the idea himself. Other major revisions of legislation he drafted were the Bankruptcy Act, the Patents Act and the Trade Marks Act. John Q Ewens in many instances collaborated with State Draftsmen also. However, if there was a way to bring proposed legislation within Commonwealth power, John Ewens would be able to do it. Besides being the doyen of legislation drafters, he was also the trusted leader of Attorney’s-General and of Prime Ministers. He was Australia’s representative at a number of international conferences and meetings and on many government committees. His intellectual and personal integrity were never questioned. Upon retirement, John Q Ewens began a new career. The Commonwealth Secretariat in London engaged him to advise on the organisation of their services in the field of legislative drafting to Commonwealth countries in the Pacific. From 1973 to 1975 he was involved in the re-drafting of Australian Commonwealth legislation, much of which lapsed upon the demise of the Whitlam Government in 1975. In 1976 he was engaged by the Commonwealth of Australia to prepare the Norfolk Legislation which made it necessary for the Australian Government to give substantial independence to the Island. He visited the Island many times and was requested by Norfolk Island itself to undertake their legislative drafting until they could find someone permanent. In 1978, John Q Ewens was appointed a part-time Commissioner of the Australian Law Reform Commission. He undertook much drafting work for the Commission. His work was widely respected and other bodies including the Victorian Law Reform Commission and the Constitutional Commission entered into competition for his services. As the years went by he spoke of his deteriorating eyesight, but there was never any sign of the deterioration of his perception. His lack of tolerance of the second-rate melted over the years, but his ability to recognise and reject anything second-rate did not. His colleagues all recognised him as a gifted lawyer who had made a unique contribution to the law of his homeland, Australia. He occasionally spoke of retiring completely, but this was never taken seriously. He loved language and law to such an extent that he would continue to draft as long as their were clients to solicit his expertise and these certainly were not lacking. David St L Kelly finishes his Preface with "The contributors of these Essays (of Legislative Drafting) congratulate John Qualtrough Ewens on his 80th birthday. They are honoured to be able to do so in this formal way."